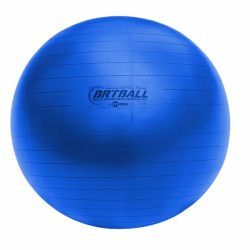 The Champion Sports Burst Resistant Training & Exercise Ball can be used to improve balance, flexibility, and core strength, making them the ideal product for rehabilitation and fitness. Made from our exclusive patented Flexton Silpower® material, this ball will deflate slowly if accidentally damaged by small cuts or punctures. The balls are super soft and tacky, offering a “foam like" padded surface for extra comfort.